In 1944, when the Hindi feature film 'Bhabhi' (The Sister-in-law) was first screened in Aligarh, northern India, one of the women in the audience remarked that the attractive heroine looked remarkably like her daughter-in-law. When other relatives accompanying her said that the heroine - Renuka Devi - indeed was her daughter-in-law, the woman refused to believe them. Her daughter-in-law was a Muslim, while the heroine had a Hindu name. More importantly, she was convinced that her daughter-in-law, Khurshid Mirza, who had three daughters, and belonged to a conservative respectable family, would never act in films. But doing the unexpected and following her instincts was what Mirza believed in. At a time when acting in films was not considered an appropriate or respectable profession for women, Mirza took the bold step of not just joining films but also adopting Renuka Devi, a Hindu name, as her celluloid identity. 'A Woman of Substance - The Memoirs of Begum Khurshid Mirza', published by the Indian feminist publishing house, Zubaan, was recently released in India. The book is edited and compiled by Mirza's daughter, Lubna Kazim. Kazim, who came from Pakistan for its release in early March 2005, said that neither she nor the publisher, Urvashi Butalia, had any disagreements over where the book should be released. It had to be Aligarh. The book talks about the uproar in the small Muslim dominated city of Aligarh during the mid- 1940s when word spread that Mirza had joined films. Local newspapers criticized Mirza. Her father, Shaikh Abdullah, was advised that as the founder of the first Muslim girl's school in Aligarh, he had the responsibility to stop his daughter from setting a bad example for other educated Muslim girls. Mirza's mother - Waheed Jehan - advised her daughter (then in Bombay) not to visit Aligarh until the controversy died down. Mirza was able to visit her family in Aligarh only in 1946 - two years after the release of 'Bhabi'. "My mother was an extraordinary woman. She believed in doing what she considered right. Whether it was joining films, getting married at an early age, or following her husband Akbar Mirza to Pakistan after the Partition, my mother rarely bothered about what other people would say, as long as she had the support of her own family," said Kazim during her recent visit to Aligarh and Delhi. Although Mirza grew up in a conservative place like Aligarh, it did not prevent her from climbing trees to steal mangoes or beating the boys at their own games. Despite being punished for her pranks, Mirza continued to be spirited. Much of this was because both her parents were broadminded and liberal. In fact, Mirza often said that she was amazed to find her mother, who came from an orthodox Muslim family and had never travelled beyond her home, had more modern ideas than her father. It was her mother who stopped Mirza and her younger sisters from wearing the burqa (veil), though she herself wore one. Mirza's mother believed that girls who wore the burqa were more prone to tuberculosis as it prevented them from breathing fresh air. While Mirza's mother was forward thinking, her father Abdullah too, was ahead of his times. When he, the eldest son of a traditional Kashmiri Brahmin family decided to convert to Islam, his parents were shocked. They refused to accept their son - Thakur Das - who had now become Shaikh Abdullah. Abdullah, a vocal proponent of women's education, went on to start the first girl's school in Aligarh. Fighting against all odds was a trait Mirza had inherited. After some associates suggested that she had great stage presence and would do well in films, Mirza, without informing her husband, wrote to the then famous director Himanshu Rai in Mumbai (then called Bombay). Rai invited her and her husband to Mumbai. Mirza went to Mumbai with her husband and after a successful screen test, never looked back. It was Mirza's second film 'Bhabhi' which made her famous. Its success led to other films, like 'Naya Sansar', 'Sahara', 'Samrat Chandragupta' and 'Ghulami'. Working in films, writes Mirza, was the most productive and creative period in her life. It was made possible by Rai, and his famous actress wife Devika Rani, who not only taught her the ropes but also treated her like a member of their family. 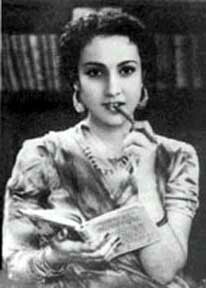 She received the same kind of affection from the famous actors of the era - Ashok Kumar, Pran and David. However, Mirza had no qualms in giving up fame and films at the age of 26, when asked by her husband, a police officer, to join him in Nainital where he was posted. Neither did she hesitate in going to Pakistan when he decided to migrate in 1947. There, she joined hands with the wife of Pakistan Prime Minister Liaquat Ali Khan, to help displaced, destitute and traumatized women arriving from India. Although coping with a financial downturn and the sudden death of her beloved youngest daughter (who had Down's Syndrome) was difficult, Mirza decided to complete her education and went on to do her BA, and then MA, in English in 1963. She also wrote short stories for prestigious Urdu magazines and plays for Radio Pakistan. The coming of Pakistan TV in the mid-1970s gave her talent a fresh impetus and made her one of the best-known TV actors of that time. Mirza died in 1989. Kazim says Mirza would have been happy to see improved relations between India and Pakistan. "She always believed that there was no divide between the people of the two countries and that art and culture would be a great binding force. The love that she received in India and Pakistan is proof of this force. I know that her work will always be valued by both countries," says Kazim.